About a year ago, The Logging Road Cyclist sustained serious damage to what he thinks is his pudendal nerve. While months of visits to various specialists failed to produce any definitive diagnosis, the fact of pain in the perineum, or colloquially the “taint”, remained. The damage happened while climbing up the steep Skillings side of McCulloch Peak, a road TLRC had ridden dozens of times before. Same ride, same bike, same seat. He had slid forward on the seat to keep the front wheel weighted as he had many times before. This time, however, at the top, he felt an odd pair of filament-like things down there, like tendons or something, and that was all she wrote. Three months later, he was able to walk without causing pain in the affected area. Another month or so and after lot of seat modifications he could paddle his kayak and ride his recumbent a bit. TLRC had pretty much given up on ever riding his upright bikes again. By the Fall, TLRC was experimenting with taking his Gold Rush recumbent out on the logging roads. With touring tires and fenders, he rode up McCulloch a couple of times. It took a lot of effort. 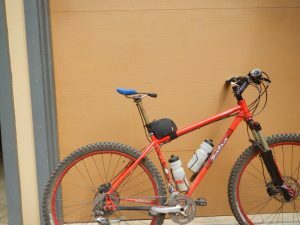 He rode up Old Peak Road to the parking area at the North Ridge Trail and down Woods Cr. Rd. This was all encouraging, so he tried Prairie Mtn. This was not. About 5 miles up, a shooting pain in his right knee convinced TLRC that perhaps this superbly designed road machine was less than optimal for really steep logging roads and another debilitating injury lay ready to pounce should he persist. 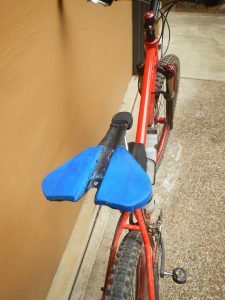 After this year of stoic suffering off of his bikes, TLRC felt healed enough to dip his toe into the water and try out some saddles designed to prevent or alleviate injuries like his. Relief Channels. Typified by the Selle Italia Max Flow the large family of Selle SMP saddles, and any number of offerings from other manufacturers, these use a cutout or trench running for some length along the saddle or its nose to relieve pressure. TLRC tried a number of these, and while they might have helped prevent his problem, he is damaged enough that they didn’t feel safe for him. “Noseless” Saddles. Adamo makes an array of saddles considered noseless, but they do not seem noseless to TLRC. A lot of people seem to like these saddles, especially the tri community, but TLRC could never figure out how to hang himself on one of these. Bi-Saddle makes an intriguing product that is not quite noseless, but is highly adjustable and has potential. The only truly noseless saddle that TLRC spent any time on is the Spongy Wonder. This saddle truly has no pressure in the perineum, is built to be used seriously (unlike some of the other “bench” type saddles that are meant for comfort or city bikes), and in spite of the whining one will encounter on various forums about how one can’t control a bike without a nose on the saddle, it is quite possible to ride the Spongy Wonder over pretty rough terrain. TLRC thought he had found his solution, but he was unable to get the Spongy Wonder adjusted so that it did not impinge on his sciatic nerve, which was quickly leading to additional problems he didn’t want. 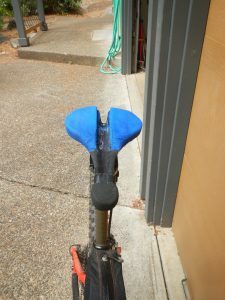 “Rear Lift” Saddles. Versions made by Rido and SQ-Lab reduce perineal pressure by raising the rear part of the saddle where the sitbones go so that the nose of the saddle doesn’t press into the soft parts so much. These are a great idea, and the SQ-Lab saddle that TLRC tried was especially comfortable, but none of them quite did it for TLRC. To much padding on the nose, an arch in the forward part of the nose and not enough padding at the rear made them just not quite work. Finally, TLRC just decided that his One Goal for the summer would be to make a saddle that he could ride. All the commercial options above were close, so he figured he could make something work. TLRC began with the shell of a Bontrager Yatra saddle. He chose this mainly because it provides a good, flat surface to glue foam to. Once the cover is pulled off the little channel that edges the shell needs to be cut off and the nose trimmed. Finding suitable foam was difficult. Most closed cell foam is too soft, and will remain compressed past a certain point (thanks to The Foam Man for pointing this out!). TLRC got an extra hard yoga block to use. This has a couple of drawbacks but has worked well so far. Because of the curvature of the saddle, the foam needs to be cut into roughly 1/4″ slabs (TLRC made a miter box to guide the cuts and uses a Japanese pull saw). The foam is applied in three layers with a very generous 1″ wide relief channel, then trimmed to follow the edge of the shell. One of the tricks is to extend the foam forward far enough for one’s pubic ramii to rest on them when tucked forward, yet not so far as to extend into the groin and perineum. The other trick is to sand the foam so that it is the full 3/4″ thickness in the front, but only 1/4″ thick at the rear. For this TLRC used a sandpaper rasp: a piece of 1×4 with 60 grit paper glued to one side and 36 grit on the other). This allows the saddle to be mounted in a strongly nose-down position while maintaining a flat seat. Thus the nose is pretty much out of the way of one’s delicates. Some custom sanding of a dip so that the saddle has a curved surface helps with comfort (TLRC used a piece of 60-grit disk sandpaper to a 2-gallon bucket to get the curvature). Finally, because the nose is wicked sharp, TLRC fashioned a foam cover for it. I have been dealing with pudendal neuralgia for several months now and have been going through the various options in your ariticle. I just tried the Rido RLT and it was a fail for me. My next step is to try the sqlab. Which one did you try? If that does not work, I will likely be making my own saddle. Unfortunately, I am not particularly handy, so it will be a struggle. You have given me hope though.